The Cleveland Browns returned to game action Saturday night against Detroit, dropping the opening game of the exhibition season by a score of 13-12. And while it was only a preseason friendly, it was nice to see the orange helmets in action against another team. The quarterbacks: While neither Brian Hoyer or Johnny Manziel had a great night, neither did either of them have a poor one. Hoyer looked solid if not spectacular in finishing six-of-14 for 92 yards. He had a few overthrows and was hit by a drop from Miles Austin. 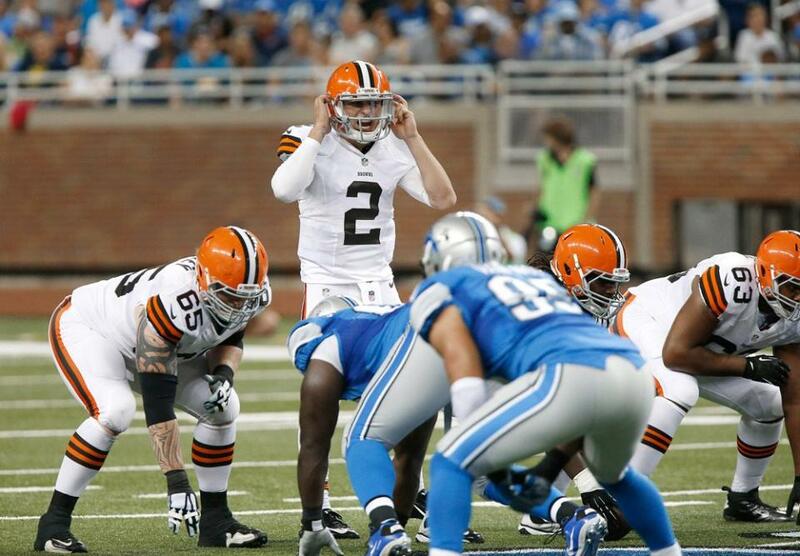 Manziel was a bit more exciting, finishing seven-of-11 for 63 yards while leading the Browns in rushing. More importantly, neither Hoyer or Manzeil put the Browns into the end zone. While it is a matter of when, not if, Manziel takes over the starting quarterback position, we can’t help but think that Pettine would still like to name Hoyer the starter for Week 1 in Pittsburgh. But unless Hoyer significantly outplays Manziel over the next few weeks, the coaching staff may decide there is no real reason to delay the start of the Johnny Football era in Cleveland. Desmond Bryant: Even though he was only credited with one tackle, we liked what we saw from Desmond Bryant. He only played a few series, but he just seems to make the defense better when he is on the field. The opposing offense has to account for him, which should create opportunities for Barkevious Mingo (who had the Browns lone sack) and Jabaal Sheard, among others. The running game: Ben Tate was productive on one run for eight yards, not so much in gaining 17 yards on five other carries. Terrance West averaged 2.2 yards on 10 carries. Overall, it looked very much like a repeat of last year’s disastrous running game. The wide receivers: The game against Detroit highlighted the conundrum facing the coaching staff. Josh Gordon is clearly the team’s best wide receiver, but he is also facing a suspension which could last the entire season. Play him too much and you take away reps from receivers you may actually need on the field this fall. But play him too little and, in the small chance his suspension is reduced, then you’re not getting your best offensive weapon ready for the season. As for the rest of the group, no one was bad, but no one was particularly noteworthy, either. The hope right now is the receiving group (minus Gordon) turns out to be better as a group than as individuals. Remember, this is just preseason (and the first game at that). While what happens on the field is important as far as developing the team goes, it is not the be all or end all to everything. We were talking to Cleveland Frowns earlier today and he pointed out that Brandon Weeden looked good at times in the preseason, so it is probably prudent to not take too much away from Saturday’s game against the Lions. We’ll see just how correctable everything is when the Browns return to action a week from Monday to take on Washington.